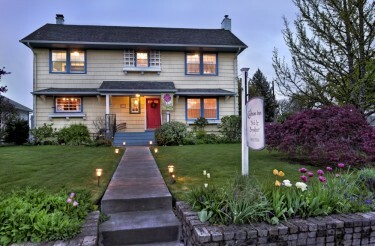 Built in 1915, The Carlton Inn Bed & Breakfast is located within the charming community of Carlton, known as “The Wine Capital of Oregon.” A short walk out the inn’s front door you’ll discover over a dozen tasting rooms and wineries as well as unique shops and wonderful restaurants. A short drive and you’ll reach even more places to explore. The Carlton Inn Bed and Breakfast has four comfortable bedrooms, 1 with a king size bed and private bath, 3 with private bath and queen size beds, living room with wood burning fireplace and TV area along with central air conditioning and wireless internet throughout. Freshly prepared homemade food using the best ingredients available is the hallmark of breakfast at The Carlton Inn Bed & Breakfast. This means cooking with eggs from our own chickens, and locally grown/raised foods whenever possible. Weekly farmers markets and honor system farm stands abound in Oregon Wine Country. Our own garden provides fresh herbs and vegetables that make their way into our breakfast menu. Carlton Farms is the source for breakfast sausage, ham, and bacon. Your hostess makes her own homemade yogurt and granola, and the local hazelnuts add a wonderful sweet nuttiness to the granola and other breakfast entrees. Wake up to the enticing aroma of freshly brewed coffee. Coffee and tea are available in the dining room at 8:00am. Breakfast is served at 9:00am beginning with a beautifully presented plate of fresh fruit or compote, accompanied by homemade yogurt and granola.Should you have any special dietary needs or restrictions, just let us know in advance and we will be happy to do our best to accommodate.